Find below, data products from EMODnet Geology (Phase II, 2013-2016). 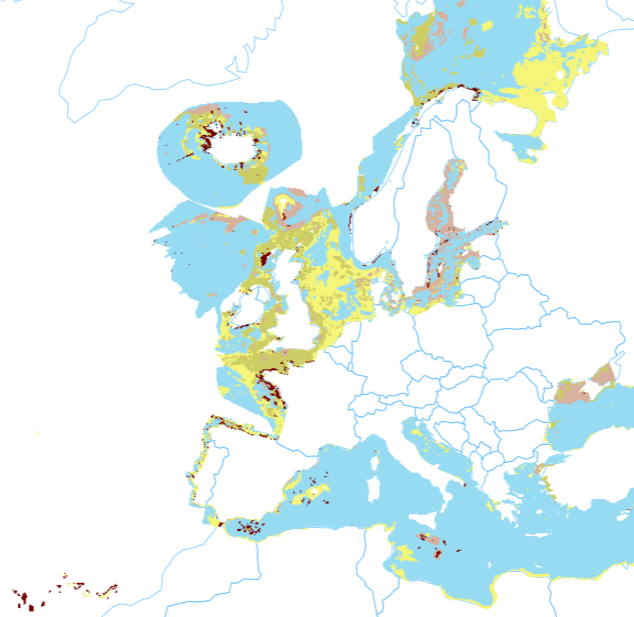 Seabed substrate map of the European marine areas including (e.g. the Baltic Sea, the Greater North Sea, the Celtic Sea, the Iberian Coast, and the Mediterranean Sea within EU waters) at 1: 250 000 scale (250k). The map is collated and harmonized from seabed substrate information within the EMODnet-Geology project. Where necessary, the existing seabed substrate classifications (of individual maps) have been translated to a scheme that is supported by EUNIS. 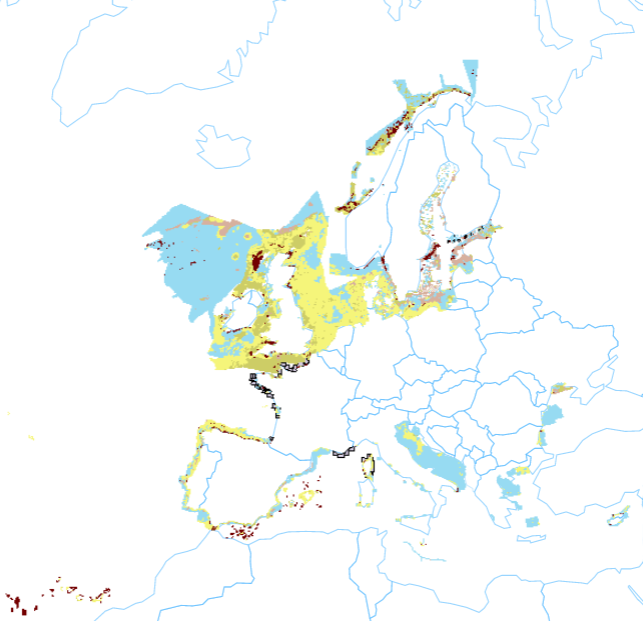 This EMODnet reclassification scheme includes at least five seabed substrate classes. Four substrate classes are defined on the basis of the modified Folk triangle (mud to sandy mud; sand; coarse sediment; and mixed sediment) and one additional substrate class (rock and boulders) was included by the project team. If the original seabed substrate dataset has enabled more detailed substrate classification, classifications with 7 and 16 substrate classes might be available. The EMODnet-Geology project started in 2013 with 36 marine departments of the geological surveys of Europe (from 30 countries), with an objective to assemble marine geological information from all European sea areas. The seabed substrate map was produced in October 2016. Note: The data may include some errors e.g. data discontinuities. Seabed substrate map of the European sea areas (e.g. the Baltic Sea, the Barents Sea, the Greater North Sea, the Celtic Sea, the Iberian Coast, the White Sea, and the Mediterranean Sea within EU waters) at 1: 1 000 000 scale (1M). The map is collated and harmonized from seabed substrate information within the EMODnet-Geology project. The map is collated from the 1M data from Partners and generalized 1:250k EMODnet data. Where necessary, the existing substrate classifications (of individual maps) have been translated to a scheme that is supported by EUNIS. This EMODnet reclassification scheme consists of altogether five seabed substrate classes. Four substrate classes are defined on the basis of the modified Folk triangle (mud to sandy mud; sand; coarse sediment; and mixed sediment) and one additional substrate class (rock and boulders) was included by the project team. If the original seabed substrate dataset has enabled more detailed substrate classification, classifications with 7 and 16 substrate classes might be available. The seabed substrate map was produced in October 2016. Note: The data may include some errors e.g. overlays, topological gaps and data discontinuities. Sedimentation rate map of the European Seas (e.g. the Baltic Sea, the North Sea, the Barents Sea, the sea around Iceland, the Iberian Coast, the Western Mediterranean Sea (within EU waters), the Adriatic Sea, the Ionian Sea and the Central Mediterranean Sea (within EU waters), the Aegean-Levantine Sea (within EU waters – including the Turkish sector) and the Black Sea. 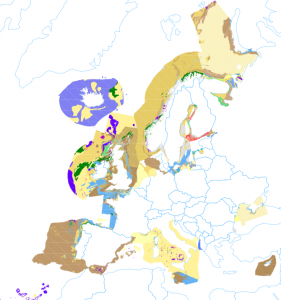 The map is collated and compiled within the EMODnet-Geology project. Estimations of modern sedimentation rates (cm/year) are based mainly on the 137Cs and the 210Pb dating. The 137Cs could be used as a time-marker in the sediment column. In the sediment column the activity peak of 137Cs corresponds to the fallout of the Chernobyl nuclear power plant accident of April 1986. Some sedimentation rates were estimated from acoustic-seismic and sediment core data. This version was produced in 10.10.2016. This map was derived and compiled from many larger scale data sources and has thus been generalized. It represents the lithology of marine bedrock of the IGME 5000 GIS and database at the time of plotting. 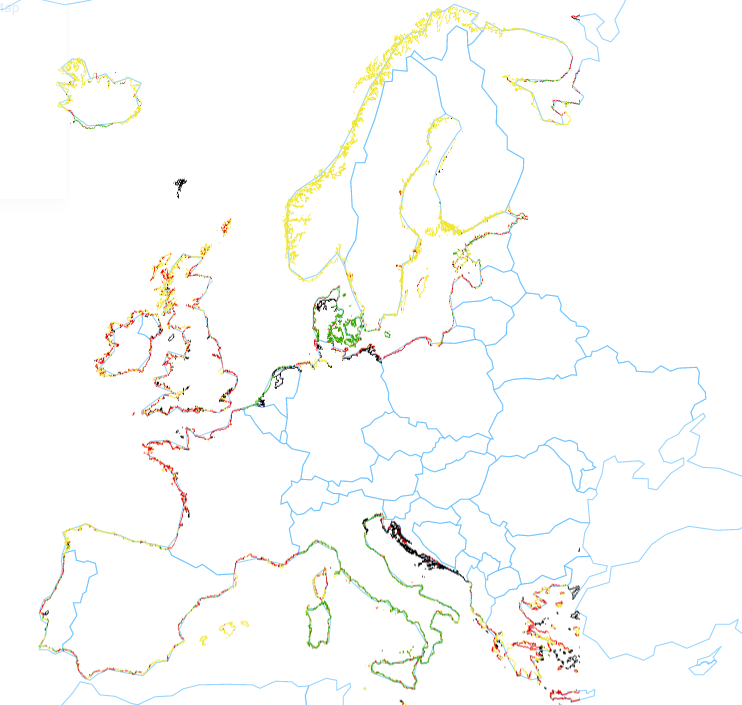 The geological feature types are transferred after the OneGeology-Europe requirements, especially lithology was mapped into 1GE_Lithology. This map was derived and compiled from many larger scale data sources and has thus been generalized. It represents the startigraphic units of marine bedrock of the IGME 5000 GIS and database at the time of plotting. The geological feature types are transferred after the OneGeology-Europe requirements, especially stratigraphic units was mapped into 1GE_Startigraphy according to the ICS 2009. Aggregate and Hydrocarbon resources on behalf of participating European partners. 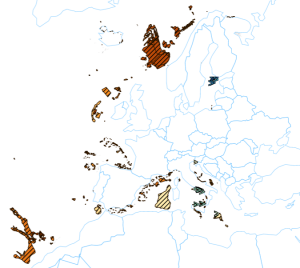 The Aggregate Resource layer has been complied by adapting European data at domain level to a harmonized pan European data model depicting resource areas, type and country codes. 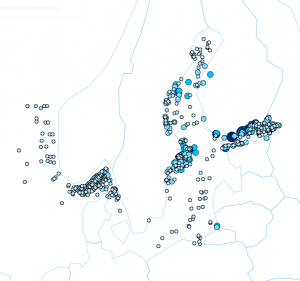 The Hydrocarbon Resource layer has been complied by adapting European data at domain level to a harmonized pan European data model depicting resource areas, type and country codes. Data can be requested from partenrs by contacting the data source owner provided in the data layer attribution. The map service incorporates submarine slides. Slides are presented as polygons in addition to boundaries of the slides. The data has been compiled from several sources, with differing details. The main source for the slides on the Norwegian continental shelf is the Seabed project (Norwegian Deepwater Programme, Seabed project Phase II. Mid-to Late Cenozoic Geomodel of the Mid-Norwegian Continental Margin. Atlas volume (Report no. SP2-02-FS-01R-00003-04); By Fugro Survey Ltd., BGS, NGU). For slides in the other countries, the COSTA project (COSTA – Continental Slope Stability, 2004. Ed. J. Mienert. Marine Geology 213, 1-4, pp. 1-504) is the main source. Minor sources include various scientific publications and the Norwegian MAREANO project.